Coach Wooden has shared many great lessons about the little things and paying attention to detail. Coach describes paying attention to detail as the difference between champions and near champions. In many of his books, he gave us the beautiful story of how he instructed his players to put on their socks. At the first squad meeting each season, he personally demonstrated with explicit detail how to start with the toes, how to run your fingers along the side to prevent wrinkles, how to handle the heel and much more (it is actually quite a long explanation). He would demonstrate and then watch each player do it. Then he would move on to the other foot and do that one, first demonstrating, then watching. Next, how to tie your shoes. He speaks passionately about preventing blisters and avoiding laces coming undone. In various interviews with Coach’s players, they share their perspective of the sock lessons. They recall being excited and ready to have their first meeting with the greatest coach of all time. With enthusiastic anticipation, waiting to hear how they would win the championship, how he had been so successful, the secret to winning, etc., anxious to get down to those legendary practices, they would soon find themselves learning how to put on their socks. They would start the season with intense sock training and end winning the championship; quite a powerful lesson on little things. Coach left a great gift behind by recounting his dedication to the little things for us. He planned his practices down to the second. He was all about proper preparation and attention to the smallest detail. No matter what success his team encountered, he always stayed true to his Pyramid of Success, living all of the little things explained within and doing his personal best in all things (big and small). He started every single season with the socks. I have heard Eckhart Tolle talk at great length about noticing how it feels to pull on your pants, how to feel the fabric on your skin, how to experience every part of getting dressed in the morning, bringing presence to it all. He talks about truly experiencing our morning shower instead of not really being there because we have allowed our mind to distract us with thoughts about the day or worry about the past. He describes the difference in really being there and feeling the water hit our skin and the joy of that everyday experience we so often miss. Thich Naht Hanh tell us, “Drink your tea slowly and reverently, as if it is the axis on which the world earth revolves – slowly, evenly, without rushing toward the future. Live the actual moment. Only this moment is life.” I have heard him describe the experience of tea. It is lovely. When asked how long it takes him to drink a cup, he said it was about an hour. A mindful cup of tea is an hour well spent. If you do little things well, you’ll do big ones better. I have a plaque on my desk that says the quote above. It has no name attached to it; someone said it, someone made the plaque. I am grateful they did. It is a nice reminder. 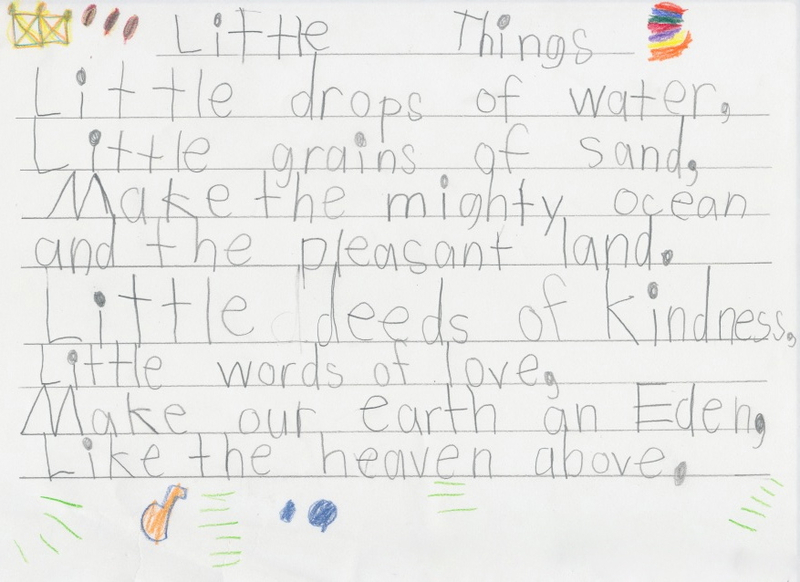 Years ago, my son found his favorite poem. He recited it quite frequently, even in front of his preschool class. It just so happens, it is called Little Things. It is by Julia A. F. Carney. I included this image below in a previous post about Beauty. To me, this is a beautiful image because it is my boy’s sweet young writing and because the words are so powerful and contain so much wisdom. On his own, at three years old, he connected to these words and repeated them countless times throughout our days. That little thing he did for us was really a huge blessing. Nothing big can happen without countless little things happening just as they should. We create and design our world with each and every little thing we do. This isn’t about doing things perfectly, there is no such thing. It is about bringing presence to everything we do and doing it with our fullest attention and awareness. It is also about learning how to set goals that will allow enough room to keep all the little things in sharp focus. I have noticed how awful it feels when I cannot do things to the best of my ability and with my full attention. I would rather choose not to do something than have to rush through and half-way go through the motions. My soul knows about the little things and what grounding myself in them feels like, anything less is numbing, inauthentic and brings suffering. Doing the little things well is truly living, it’s really being where we are and honoring every little detail. All the little activities, choices, thoughts, etc., turn into how we are creating the world we live in. Treating every little thing as sacred brings more presence, more love, more peace, more joy, more miracles, more alignment with our soul’s purpose — more of everything we are meant to live. As you set your goals and resolutions this year, be sure you have enough room for honoring the little things. Those little things add up, multiply and come back to bless you in countless ways — big and small. May the goals you set for yourself this year be blessed with the proper attention, awareness and presence for honoring the little things necessary to achieve them. Wishing you joy and presence found in putting on your socks, pulling up your pants, taking a shower and drinking a cup of tea. Sending you love! Jesus’ living example of what it looks like to live the golden rule and in peace that passes all understanding is a magnificent gift for everyone to see. It is a beautiful thing to look at how Jesus lived so that we can see all we are meant to be. We can be kind to everyone we meet, without exception. We can love everything without fear. We can cast aside all judgements as we embrace, encourage, welcome or at least accept, all things. We can be infused with peace that comes from within and isn’t shaken or changed by life’s circumstances or situations, no matter what form they come in. That spark of love in us all can make these things possible; Jesus came and showed us how. Wishing everyone abundant peace that comes from living with a kind and open heart rooted deeply in joyful being and sacred listening to Life’s miracles. From my heart — thank you for visiting me here! In the journey of life, all roads worth traveling point to the stillness and going within. Life cannot be lived well or peacefully focused without. It doesn’t work. Spaciousness is essential to realizing who we are and where true peace comes from. As we put more space around everything — every choice, every word, every action, every emotion… we open up more room for peace and the experience of stillness to take hold. 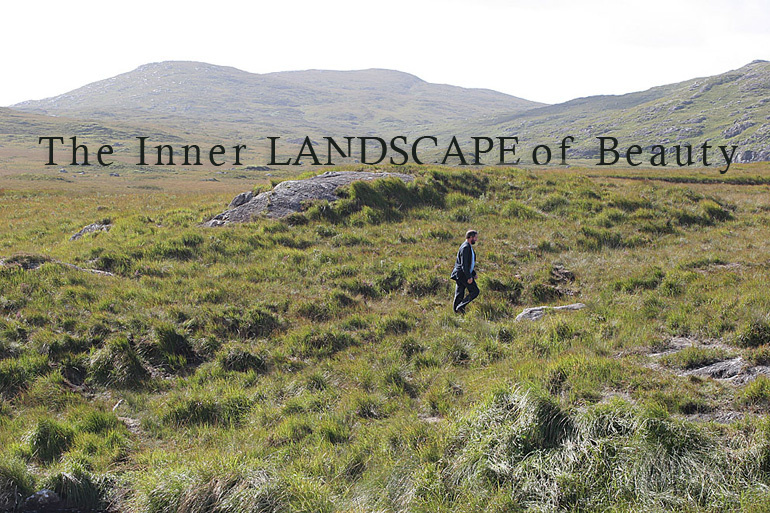 The space and stillness is who we really are, it isn’t empty space, it’s where our essential selves are. All the rest is our personality covering over the real us. We can spend a lot of time working on the personality and training it to be all kinds of things, but, underneath it lies a joy and peace that we are all meant to dwell in. This is the connectedness we share with all things. We have all experienced how a few deep breaths can allow us to make a much better choice by cooling our temper or gathering our courage before a bad choice or reaction. That breath took us to who we really are and allowed more of our true self to emerge and make the better choice. We can work hard on our self-control, which is important; but, we must allow our self-realization to emerge so that we can live in the peace and joy as a permanent state of being. We can put more space around each and every thing by really experiencing it, from the most challenging situation, to the sweetest gesture from a loved one and everything in between…simply being there with it in a more meaningful way, with a lot of pause and breath and attention. It is the path to joy and peace. Avoiding things or distracting ourselves from things we don’t like only keeps us stuck in the repetitive lessons of a shallow life. Judging and labeling situations and people robs us from our peace and joy by keeping us swirling in our thoughts about things instead of immersed in life and being; those thoughts keep us from the space and stillness. Accepting whatever comes our way and giving it the most of us will deliver us to our truest selves. I haven’t yet mastered the ability, nor found the time to sit on my meditation mat for hours each day. Sometimes I wish I was better at it and could give more time to it, then I remember that there will be time for that. I am sure of it. I understand that I am in this busy time of life right now with so many different roles, goals, responsibilities and others counting on me, etc., and that is all just as it is meant to be. I don’t have to wait for more space and stillness in some future that would allow more time, I can use my life situation just as it is now to bring more space and stillness to all that I am doing. I can use all the little “doings” in my life to allow more of my essential “being” to emerge. This is my practice. Loving all little things and honoring them with enough space to be is a great practice. Slowing down to be with each little thing. Add a breath before and after everything. Feel things more deeply. Before you do or say or think anything, just be. All the doing can become more miraculous. Life can feel more meaningful; the key is in honoring each and every little thing you do…it all connects to the next moment. Everything is sacred. Cherish everything. I am wishing us all the wisdom to stop and be where we’re at and cease walking through the precious moments we are meant to experience. I am wishing us spaciousness and stillness as a permanent companion so we can truly feel who and what we are and live in the peace and joy that has always been there waiting for us. Thank YOU for visiting me here! This is an important part of my practice and your visit honors it and encourages me so very much! Years ago when I began watching my thoughts and making the connections between my mind and my life, I noticed all sorts of interesting things. The work itself is in not becoming attached to the myriad of thoughts that are constantly coming our way; it’s noticing the thoughts floating by like clouds trying to get our attention and being okay with letting them pass…not resisting them, just choosing well which ones we allow in. When we do give certain thoughts our attention, they come down right in front of our face and grow and seem to hold us captive in their aura until we can release them. We are left sort of under the influence of whatever thoughts we have allowed to grow and take hold. I love this work and I understand the practice it is to remember it fresh in every moment. What about the emotions…what do we do with them? As I continued working with the thoughts and in-a-sense changing my mental habits or taking responsibility for the thoughts and energy I bring to all things, I noticed a lot of things about happiness in general. I was devouring books like crazy, trying new practices, praying for guidance and in general just working towards a joyful, purpose filled and meaningful life. Often, I would pack my babies up in the car and head out to start our day feeling like I could take on the world and remain in bliss all day. The mornings always felt fresh and ripe with possibilities for using all my new tools and truly living all I was learning. I distinctly remember the day I was driving in my car feeling like I was so very happy. I was thinking, “I am soooooo happy” over and over again. It was great, completely exhilarating! It wasn’t the first time I had done this of course, but I remember the day that the help for this condition came. The happy thoughts were followed by a clear voice (my own voice from a deeper place) saying something along the lines of, “Wait, relax, don’t do that, just be here, just be okay with here.” I found myself breathing and grounding myself in something deeper behind the “happy” feeling. I knew instantly that I didn’t want to jump on that happy train anymore. I could feel the knowing that if I did, I would inevitably find myself in the opposite direction later. It is no fun to come down from the happy and find yourself on the other side. I was growing very tired of that. I could see the rhythm and pattern emerging out of the clouds for me. I wanted out of the thoughts about how I feel and into the practice of living in the middle way. Living — just right. It was a strange feeling to know that I didn’t want to achieve that “happy” feeling anymore. I was sure though. I wanted to dwell in the real peace and joy that can sustain all things. I felt ready to release myself from the ups and downs. I caught myself that day and grounded myself in the joy that lives in the moment without over thinking it and labeling it or my mood. The real joy and peace isn’t in the extremes. It makes sense. If I go around attached to the idea that “I am so happy”, then anything that challenges that idea or brings me back down to dealing with life’s little challenges, choices and behaviors creates massive resistance. I would be so attached to my “happy” that anything threatening it would be most unwelcome and incite all kinds of reactions I don’t want to succumb to. The “happy” brings resistance and struggle, making it very difficult to live each moment joyfully the way we are meant to live. The peace behind the happy that is “just right” allows all things to be as they are and isn’t dependent on what happens. Whatever happens is just right. Whew! I continue the work to this day of course…chipping away at it as I go, grateful for all the progress, as well as all the work ahead. The joy is in the journey. I fall often, dust myself off, and get back into the stream of life that I know is always there waiting for me. Sending you love and joy and wishing you a day full of all things just right! He goes on to talk about some great conversations he has had lately… he describes them as “food and drink for the soul”… In his next words he says the second thing to always ask one’s self is, “Who are you reading and where are you stretching your own boundaries?”… which prompts, of course, more lovely conversation. This man is a poet, everything he says is like music! He covers so many topics in this talk, but for me, great conversation is worth spending some time on. I love how he describes the common conversations in our culture as “two intersecting monologues”…that is so true! You can feel it when someone is just waiting to say their next thing and not really interested in what you have to say. You can also feel it in yourself when you’re doing the same thing — just waiting for them to pause so you can talk. It is deadening for the soul. I often find that people are surprised when someone really listens to them. I can feel it when their heart comes alive a bit more and they just open right in front of me. It does hurt when someone can’t listen to you, but it isn’t something to take personally (nothing is). People will listen more when they are ready. We can help them along by truly listening to them and honoring them with our fullest attention and interest. The holidays are upon us, we’re blessed with so many moments of family togetherness and friendly celebrations this time of year; now would be a lovely time to practice having great conversations. They don’t have to be as deep as what John O’Donohue describes above, it would be nice if they could be, but we just have to start somewhere. When we’re with our loved ones and friends and even meeting new friends (every friend was once a stranger), we can bring honor to the words we share with them by truly being there with them and listening to what they may share with us. Your heart and soul know how to do it, you just let yourself be there in the moment and your soul will do the talking, and more importantly, the listening. Dare to ask great questions and truly listen to the answers. Have fun with it. Have joy with it. Your heart will open and you will feel more fully alive. Wouldn’t it be lovely if we all really talked to each other as our true selves, without the image of us that we project throughout our days. It is lovely to truly show up and authentically BE wherever you are at. It may seem as though it isn’t practical, but it is. We can truly be where we are at and honor the moments as the sacred gifts they are. Things are waiting to be seen by you and moments to be experienced by you. My wish for us all this holiday season is the gift of great conversation that awakens the soul and comforts the heart. May you see kindness wherever you look and spread joy wherever you go! Sending you love and joy! Every single moment of our lives is trying to tell us something. Life itself is the moment. We must make room to allow enough listening to hear what the true message of the moment is. We must bring honor and sacredness to the art that is listening. Every encounter with any being or even just in stillness is an opportunity for deeper listening. More than just a portion of our attention while we multi-task is required for the type of listening we’re talking about here. How do you hear well enough to truly receive a smile? What could be worth skipping a smile meant for you or missing the sound of laughter? Why have we allowed so much noise to creep in and take us from the deeper currents of life? In a recent Eckhart Tolle talk, he was discussing his teachings and he said, “The person got out-of-the-way enough for the teaching to come through.” I love this idea. If we allow our personalities and all our distractions in life to dominate our experience each day, we don’t leave any room for the sacred to come through. We all know about intuition and we can feel the pull that comes from our “gut” telling us something. We choose if we take the time to practice really listening to life and following where it is leading us. We have the stillness inside that has all the answers we seek. We often cover it up with one distraction after another or we let others tell us what we should do. Perhaps we fear our own authentic power. There is nothing to fear; only love to be found. We are meant to hear the messages, they will get louder if we stay focused on noise and reside in distractions. from five-sensory humans into multisensory humans…. Our perceptions are everything. They create our entire world. How we choose to look at the world determines what we will see. How we listen to the world determines who we will be, what we will create and how we will live. It must be noted that our thoughts aren’t always worth listening to. In fact, most often, they are not. We aren’t talking about listening to our thoughts and acting from them. We must go deeper and let the thoughts be what they are — only thoughts. They will pass. We don’t want to make choices because we are under the influence of our thoughts that crept in. We want to listen deeply and use more than just the five senses as we expand and live more fully as our essential being. There is more to listen to. A simple act of slowing down can help on the path to listening to more of life. I know deeply that the more we can listen to life, the more we can live. I also cannot emphasize enough the importance of clearing the mind and touching the stillness as we slow down. Watch those thoughts and lean back into the space that hears them. There is much more to you than the thoughts. Be the space behind them. Resist jumping on the thoughts and allowing them to grow. Choose your thoughts and choose your life. Another great practice to bring more listening is accepting what is. Even if someone is being rude, speaking with a harsh tone, interrupting you constantly, saying something you don’t want to hear, acting stressed out…whatever it is, there are reasons why these things are happening. Being the space of loving listening can help ease the suffering of others in so many ways. Accepting what is brings more love into the world. We can love all the great things we encounter quite easily. We can also love the not-so-pleasant things we see as well. There is truly only love and fear. As you see love, of course, love it and spread it. As you see all other things, remember — it is only fear. Give it love too and you can ease suffering and bring more love to the world that way. Even the most dreadful behaviors come from a place of fear. It sounds simple, but it is true. Just love the love and accept the fear as you provide a non judgmental place for it to transform. Any energy spent resisting what is will bring suffering to you and those around you. Resisting what is doesn’t allow you to see and hear what life is telling you. Accept it all as you listen deeply to whatever you are supposed to hear. courageously swim in the deeper currents of life; trust your knowing…treat life like one big doing meditation…it is. One more thing, it is a great hint in life to follow the beauty…true beauty that is. God/Life/Universe/All is in the beauty. See that, hear that, be that and you’re on to something. Hopefully you have time to follow the beauty in this lovely poem below by Mark Nepo. He has gifted the world with amazing work on listening. His latest book is called Seven Thousand Ways To Listen, it is definitely worth the read. Enjoy this gift from those pages. Wishing you the courage to swim in the deeper currents of life as you spread love by truly listening to everything! Sending you love and joy! My sweet six-year-old boy has been stressed lately. It has been noticeably escalating and it has been heavy on my heart. To see his little shoulders up so high and tight and hear the sound of his voice so heavy with stress while responding to everyday things has been tearing at my soul. He has been frustrated and easily irritated. It has all been very out of character for this light in our lives. I can remember how this phase of life is stressful…in between the cute tiny guy and the little kid with budding responsibilities and expectations, etc., so I was trying to accept it and go with the flow of it a bit. I do believe firmly in guiding him towards his personal best though, so I am sure he has been hearing plenty from me about self-control, etc., along the way. His stress wasn’t huge…just there…and taking my boy further and further away from the joy he so easily resided in before. As I tried to be in the flow and avoid the fear of this being the new normal with him I kept it real with myself, knowing that I am the mother of our environment and I must be contributing to this in some way. One night this week I found myself just about in tears from what felt was becoming a different relationship between he and I…we are very close and I just felt so sad about the new disconnection. I just missed him so much and it felt like he was constantly on me about one thing or another…just kind of checking with me all the time saying “What is it Mom?” when I wasn’t even thinking anything and taking every move I made personally as if I had some serious issue with him. It was like being under a microscope and it was dreadful. I felt tight all over and not the best version of my mommy self as I tucked him in. Tuck-in time was even different. Ugh. To be honest, I didn’t give it much thought after that. Answers like the one I needed don’t come from thoughts. I went strictly with the heart on this one. It was perfect. He came into my room first the next morning, which is unusual around here…my daughter is the morning person. He came first and alone. I scooped him into my arms and without having planned it or rehearsed it or even thought about it in any way…I poured my heart out in just way he needed to hear it and could understand it. While holding him tight, I told him…”Do you know that I have never ever been disappointed in you? I have never been. I have always been so very proud of you. You are such an amazing person and you are just the best thing in the world to me. You are my heart and I love you with everything I am. I have never been disappointed by anything you have done and I just adore and appreciate you so very much.” …I went on to explain that I still need to be the mommy and help him make good choices, but I truly feel only joy and gratitude for all that he is to me. I asked him if he knew the part about me never being disappointed in him…he said he didn’t. It all made sense. He’s been getting bigger and he is preparing for more expectations and responsibilities. He was feeling that we were disappointed in him for the first time in his life. What a terrible feeling. That is what takes the joy and spark out of the kids…feeling that they disappoint. It is hard to make the transition from baby to little kid. Love and compassion are the only way. Since we had that discussion he has been back…in a big way. He immediately expanded and softened and all the stress came out of him. His eyes have been sparkling, he has been giggling and going with the flow of life again. Hurray! When I tucked him in at the end of the night, I asked him his favorite part of the day, he said, “I just loved hugging Mommy.” We had such a cuddly happy day and we were reconnected and back to ourselves. We have a few days under our belts now and we’re better for the experience. I know I never want to allow my kids to feel I am disappointed in them again. I never was and he still felt it in some way. It’s worth taking the time to tell the children that I’m not disappointed just to make sure they don’t take my mothering personally. I know I must do everything I can to live in that space that isn’t reacting to life…that calm force in the kids lives that can make them feel safe, loved and connected no matter what comes our way. Mommy Reality Check – Today my daughter, who has been the picture of happiness the whole time her brother was stressed showed signs of a big case of bad energy. I felt the shift and realized that even though she loves us both dearly, it was hard for her to feel he and I so close again. Some part of her thought she would lose something. I did everything I could to connect with her and reassure her that she means the world to me just like him. We discussed how we always want all of our team members in this family to feel their very best and having one of us stressed out in any way is bad for all of us, etc. She tried, but her energy lagged here and there and required lots of talks. Whew, motherhood is a major spiritual practice. I am up for it and so very grateful for the gift that it is. Sometimes I feel like I have been squeezed dry of all my energy, but I always replenish and get back to spreading love. Love Story – when I shared the discussion my son and I had about me never being disappointed in him with my husband that night, I saw tears in his eyes. He was visibly touched for us both and his deep love and compassion showed. We had a great talk about it, it was lovely. This family is a school of compassion. All families are. What a blessing! Wishing you all love, compassion, joy, cuddles and a family full of team members that know they haven’t disappointed each other, ever. It is lovely to see people supporting each other in this way. There are some amazing bloggers out there listening to their voice inside and sharing what is meaningful to them with the world in magical ways. I am so grateful to my fellow blogger at DIVINEWIZ for taking the time to share this award with me… her work is full of inspirational wisdom and love. I was just expressing my gratitude for my fellow bloggers in my previous post and I received this lovely gift and show of support just after that. My heart is truly grateful! 1. Where would you most like to travel to? I love the idea of seeing more of the world; as the kids are getting bigger, I love the idea of us expanding our adventures wherever life may take us. We are listening. 2. Do you have a sweet tooth? It’s nice to end a meal with a nice piece of vegan dark chocolate or fruit. My family loves vegan ice cream; I partake every once in a while. My favorite treats are the Jewel Collection from Xan Confections…yummy little vegan caramels…thank you Whole Foods! 3. What motivates you to keep you blogging? I am passionate about working towards becoming more of my essential self. I love the spiritual journey that life is! I love listening to the lessons of life and doing my part to live what I grow to know. Helping others do the same is my dream and deepest desire and intention. I love having a space to ground me in the work while I try to spread joy and meaning to others. I hope I can be of use to others in some way. 4. Who is your favorite comedian? Anyone who can make you laugh with kindness and pure joy. My kids are pretty funny. 5. What is your favorite outdoor activity? Tennis. We love playing as a family and I am trying to keep up with my kids — they are pretty amazing. We have a lot of family fun and the nature aspect of it is just the best thing in the world. 6. Who was your favorite teacher and why? I have been seeking and desiring growth for years and I am so thankful for the many teachers that life brings your way when you ask. Two favorites that stand out for me are Coach John Wooden and Eckhart Tolle…I like the balance between the two for me. I continue to learn from so many; I really could list hundreds here. When you’re open, the teachers show up and they are all around us. I guess my very favorite teacher is LIFE. I am listening. 7. Do you own any pets? No pets. We are looking forward to adopting a dog when the time is right and we can provide the best possible home. 8. Most embarrassing moment in your life? (That you are willing to share.) I am sure there are plenty. I look back now and things like falling up the stairs in high school (yes, you can fall up stairs…in my case I tripped on the first one and fell again and again all the way to the top in front of everyone) or saying something stupid at a dinner party just give me the giggles. I am grateful for all the moments that shaped me, even the embarrassing ones. It all just feels funny and silly now, no more wasted energy on being embarrassed. It’s all good and no experience is wasted. 9. Where are you from? California. I have only lived in California – Northern as a child and Southern now. 10. How much wood could a wood chuck chuck if a wood chuck could chuck wood? Ha! Exactly as much as was meant to be. The ball is in your court, you awesome bloggers. 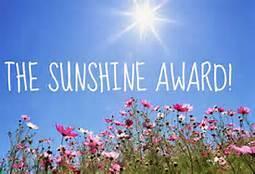 If you would like to post your award, answer the same questions I have above and pay forward your sunny ten. That would be lovely. Either way, thank you for bringing sunshine into my life. The gift of reading fellow bloggers like you and many more has been a wonderful joy in my life! Thank you again, DIVINEWIZ, for an unexpected warmth of love! Sending you all joy, love and sunshine!